We respond to approximately 400 calls for emergency services annually, some years more, some years a little less. Ironically, although we are the local "Fire Department", the majority of our 911 calls are Emergency Medical Services (EMS) related. Somtimes these are straight forward ambulance calls, but also include motor vehicle wrecks, backcountry rescue of either lost or injured individuals to treating carbon monixide poisoning from defective furnace piping. EMS calls account for 65-70% of our annual call load. Obviously we also respond to structure and wildland fires, non-unjury car wrecks, extinquish many abandoned campfires and respond to various odor or potentially hazardous leak situations. In short if you dial 911 and it does not exclusively deal with a law enforcement issue we likely respond to help solve the problem. We provide fire safety education to ~200 children annually as well as various fire code inspections, permiting and other public safety functions. The majority of emergency responders within our community are volunteers. While we have some paid staff positions to support them(and you), the volunteers are the backbone of this Department. Volunteers can either live within our community and respond based on pager or others who live outside our community, sign up for 36 hours per month of standby at the fire station. For those looking to transition to a career fire department, being a standby volunteer provides a great oppotunity for training and experience. Our mission is to serve. 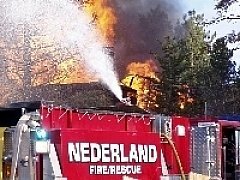 We serve the Nederland community and its visitors by providing competent, compassionate Fire, Rescue and EMS services.